Though the origin or purpose of the mysterious sphere is uncertain, experts say it could contain genetic material – the precursor to life. It is the first time anything like this has been seen and points not only to the existence of extra-terrestrial life, but to complex and civilised beings watching our planet. It follows findings that DNA capable of inserting itself into living creatures and replicating can exist in harsh space conditions. A tiny ‘plasmid’, a circular strand of DNA used in genetic engineering, was sent into space from Sweden in 2011 on the exterior of a TEXUS-49 rocket. After enduring 1,000C heat it was found to still be intact and with its biological properties when it returned to Earth. Professor Chandra Wickramasinghe director of the Buckingham Centre for Astrobiology at the University of Buckingham in England, said it is further proof of alien life. However the latest finding, by Professor Milton Wainwright and his team from the University of Sheffield and the University of Buckingham Centre for Astrobiology, could reveal a much more sinister purpose. Conjuring images as warned by H.G Wells in his 1898 novel War of the Worlds – it could have been deliberately engineered and sent to Earth to infect the planet. Professor Wainwright said the structure is made from the metals titanium and vanadium with a “gooey” biological liquid oozing from its centre. He said there are several theories as to where it came from, the first being it is a complete microorganism programmed to propagate alien life on Earth. “It is a ball about the width of a human hair, which has filamentous life on the outside and a gooey biological material oozing from its centre,” he said. “We were stunned when X-ray analysis showed that the sphere is made up mainly of titanium, with a trace of vanadium. “One theory is it was sent to Earth by some unknown civilisation in order to continue seeding the planet with life. “This seeming piece of science fiction, called “directed panspermia” would probably not be taken seriously by any scientist were it not for the fact that it was very seriously suggested by the Nobel Prize winner of DNA fame, Sir Francis Crick. Professor Wainwright and his team found the object in dust and particulate matter collected from the stratosphere. He sent balloons 27km into the sky to collect debris from space and isolated several particles he claims are proof of life in space. It comes as the mysterious “ghost particle”, also found by Professor Wainwright was revealed and follows the revelation last year of the astonishing “Dragon Particle” the first of its kind to point towards proof of life in space. Professor Wainwright said the curious orb landed on the sampler balloon it left a tiny impact crater proving it could not have gently fallen from close by. He said: “On hitting the stratosphere sampler the sphere made an impact crater, a minute version of the huge impact crater on Earth caused by the asteroid said to have killed off the dinosaurs. “This impact crater proves that the sphere was incoming to Earth from space, an organism coming from Earth would not be travelling fast enough when it fell back to Earth to cause such damage. He said one theory is the object was released deliberately to infect the human race with life-threatening diseases, another is that it travelled millions of miles on a comet. He said: “For the moment, we are content to say that the life-containing titanium sphere came from space, possibly from a comet. “NASA is currently sending a balloon into the stratosphere to look for life. 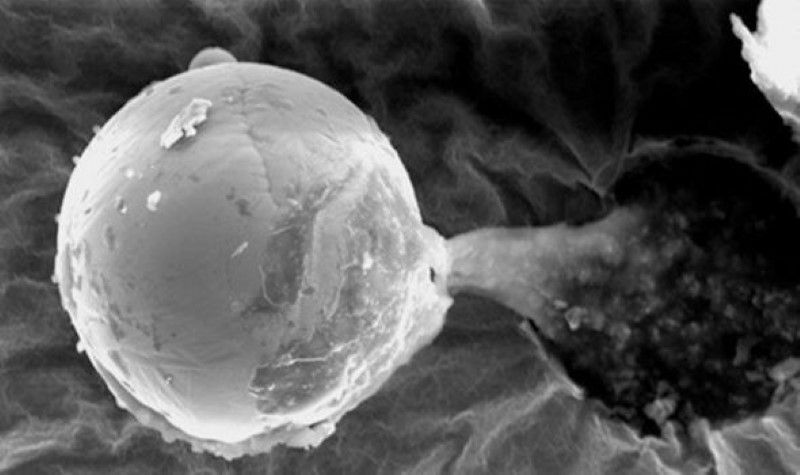 The findings come as scientists in the UK and Japan launch the ISPA (Institute for the Study of Panspermia and Astroeconomics) which seeks to prove life on Earth originated from Space. Professor Wickramasinghe, director for research at the institute has long-maintained biological material including bacteria and viruses are constantly raining down from the skies. He said: “Mainstream science and institutions have fought against theories which expound these beliefs but now evidence from meteorites, from samples of bacteria from space and from space observation is making resistance more difficult.